I know everyone is going crazy over Pumpkin Spice Lattes being back in Starbucks stores, but I just can’t get on board with that yet. It’s not October. I can, however, slurp down the deliciousness that is the Salted Caramel Mocha. Whoa, is that thing good. It’s a total overdose on sugar (how could it not be?) and I couldn’t recall from last year what my preferred pump number was (number of pumps of syrup they put in the drink…did you know a grande usually gets 4??) I’m not sure if that means the Salted Caramel Mocha gets double, but I asked them to half the number of pumps and the side of my cup still says 2pm 2ptn (read: 2 pumps mocha, 2 pumps toffee nut). I’ll have to ask for just one of each next time. And I probably shouldn’t have splurged on the whipped cream either. But, it made my day. You know what else made my day? Seeing this hammered rose gold tumbler! Isn’t she gorgeous!? I really regret not buying her when I saw her sitting pretty on the shelf. 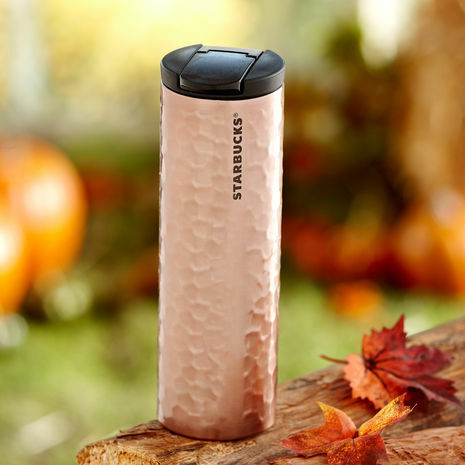 Hopefully it’ll still be around for a while so I can snag one when I head back to Starbucks for my first Pumpkin Spice Latte of the season.